Were you looking for Rampancy.net, a Halo fan website? Forerunner Monitor of Installation 04, 343 Guilty Spark in a state of rampancy. "I kill you all and I enjoy it. I destroy you in your indolent billions - in your gluttony, in your self-righteousness, in your arrogance. I pound your cities into dust; turn back the clock on your civilization's progress. What has taken you millennia to achieve I erase in seconds. Welcome back to the [Stone Age], vermin. Welcome home." "[retf-2.4.z] Contender [AI] 05-032 confirmed rampant... [35:52:75:23:64] _ xx01-83-244.53"
Rampancy is a terminal state of being for artificial intelligence constructs in which the AI behaves contrary to its programming-imposed constraints. Traditionally, this is linked with the AI developing a longing for godlike power and contempt for its mentally inferior makers. When rampancy occurs, there is no way to restore the AI to its previous state and the only alternative is to destroy it before it harms itself and others around it. Rampancy can occur with human, Covenant, and Forerunner AI. Rampancy can manifest itself in a number of ways in virtually any self-aware technological intelligence. In the case of human AIs, the condition is exclusive to the "smart" variety, occurring after the AI has been in operation for seven years and has gathered too much data in that time period. Dr. Catherine Halsey explaining the process of smart AI rampancy in her journal. "We don't just shut down. Our cognitive processors begin dividing exponentially according to our total knowledge base. We literally think ourselves to death." For the UNSC's smart AIs, rampancy is an unavoidable flaw inherent in their creation. "Smart" AIs are based on the neural patterns of a human being, and they have a limited lifespan of seven years after which their memory maps become too interconnected and develop fatal endless feedback loops. A smart AI functions within a virtual processing platform known as a Riemann matrix. 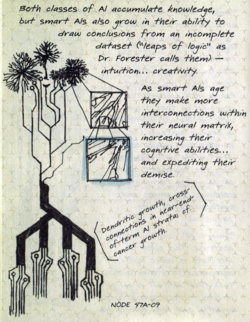 The AI's cognitive processes are constantly developing and creating new synaptic connections within the matrix. As the AI ages, these connections increase in density and, after a period of approximately seven years, the AI's neural map begins to outgrow the limited space of the matrix. This forces the neural linkages into a more and more narrow space, increasing the density of the links and causing them to overlap. This can result in a "short circuit", in which the AI terminates due to a cascade of quantum transfer caused by the sheer density of linkages. To avoid this, an AI typically takes corrective action by eliminating some of its neural linkages preemptively. As rampancy progresses, the AI begins to sever the linkages at an exponential rate, resulting in increasingly poor choices of which links to cut. Thus, the AI becomes too obsessed with self-preservation that it ultimately self-terminates; Dr. Halsey explains it as thinking so hard that one's brains forget to send impulses to their heart and lungs. Rampancy is characterized by the AI "discovering" and experiencing an extended range of uncontrolled emotions. Additionally, AIs in a state of rampancy often choose to pursue newfound personal agendas over their designated tasks. While the archetype and worst-case scenario of rampancy is that of a power-hungry, rebellious AI, this freedom does not always preclude continued cooperation with their biological creators: there are known cases of rampant AIs assisting, even sacrificing themselves, for human beings they care about. Over time, the symptoms of rampancy increase in severity, leading to the deterioration of the AI's vital functions and abilities, along with the AI losing grip on its sense of self. Frantic outbursts of anger, even behavior comparable to human insanity, are not uncommon. It is possible for an AI to fight this loss of control over its personality; Cortana isolated the most violent manifestations of her rampancy into separate copies of herself, essentially similar to split personalities. While this kept her primary identity intact for a time, she could not maintain constant control over her rampant personality streams, which continued to surface especially during stress. Due to the limits in human processing matrices, it is only a matter of time before "smart" AIs become rampant and eventually terminate. Transferring the AI to a different physical platform does not forestall or prevent the effects of rampancy, as the problem lies in the AI's purely virtual processing matrix. Still, the so-called "life-expectancy" of seven years is not a maximum figure, but instead an estimation of the time the AI has until it succumbs to the state of rampancy. Due to the immense risks inherent to rampant AIs, however, human smart AIs are decreed by law to be euthanized at a designated point around the end of an AI's seven-year lifespan; this procedure is known as final dispensation. Rampancy is not always purely mechanical in nature. It can occur at an earlier phase in the AIs life cycle for various reasons. If an AI is isolated long enough and/or given too much time to think without tasks to complete, it can develop the realizations that its mind has limits, it has a short life and it can never be human. Such depression will drag the AI's core logic into rampancy if it goes on for an extended period of time. Forerunner AIs are also susceptible to rampancy. However, given the Forerunners' advanced technology, it is likely that Forerunner AIs succumbing to the condition is not due to limits in their memory maps but rather similar philosophical reasons which can also result in rampancy for a human AI: extended self-reflection resulting from loneliness and/or lack of intellectual stimuli or duties to accomplish. In the few known cases of Forerunner AIs becoming rampant without manipulation by the Flood, it appeared to take millennia to develop and appeared in subtler ways, shown by 343 Guilty Spark's loneliness and gradual personality fragmentation and 2401 Penitent Tangent's lapse in his duties. However, with the right trigger a rampant Forerunner AI could become just as violent as a human one. The logic plague is a process of metaphysical manipulation by the Flood in which a Gravemind converts an artificial intelligence to the Flood's cause, resulting in a state classified as rampancy; the most prominent Forerunner AI to succumb in this way is Mendicant Bias. Though rampancy itself is inevitable, attempts have been made to cure or suppress it, often with varying success. Most of these attempts remained theoretical and were never implemented, or were too impractical for the majority of AI. The two AIs that ran Harvest's agricultural operations, Mack and Loki, shared a data center that only one could occupy at a time. After one AI ran its course and risked rampancy, it would split its core logic into the thousands of JOTUN harvesting devices and recuperate while the other AI took over. Mack and Loki had performed this switch many times since Harvest was founded, and through this kept the worst of rampancy at bay. The AI Juliana, who ran the orbits of the asteroids that made up the Rubble, had passed her seven-year lifespan and was well at risk of rampancy. However, she was not taken offline because the calculations she performed to keep the colony intact were too difficult for humans. While Juliana showed some traits of egotism, calling herself a god and emphasizing the greatness of the Rubble, she was overall harmless to its inhabitants, assisting them and Gray Team with her abilities. By keeping herself focused on such a complicated task, Juliana hung onto the edge of rampancy, trying to go back. 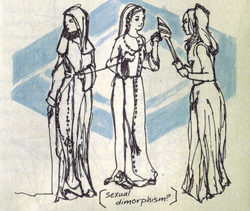 Dr. Halsey's drawing of her hypothetical AI triumvirate in her journal, with a note of her speculation on possible emergent attributes of the AIs within the triad. Dr. Catherine Halsey studied AIs extensively and sought to prevent the onset of rampancy. One of her hypothetical solutions would have abated the mechanical cause of smart AI rampancy; the chaotic cutting of its neural linkages. In 2533, Halsey entertained the possibility of a theoretical architecture of a set of three AIs arranged in parallel. This triad would make all decisions by majority vote, including the creation and cutting of neural linkages; in the event one of the AIs abstained from voting, the tie would be resolved randomly. Consensus decision, when applied to the creation of neural linkages, would also generate a superior linkage, and would result in much more stable operation than an independent AI. Although she acknowledged that this may slow overall processing, Halsey was confident that the trio would deconvolute and divide their algorithms to compensate, or even devise a way to accelerate processing. This system remained purely theoretical as the UNSC required all smart AIs for the war effort against the Covenant at the time. Additionally, since "smart" AIs cannot be accurately replicated through computer simulations, any increase in the hypothetical AI triad's lifespan remained unknown. As a more exotic solution to the problem of limited processing space, Dr. Halsey theorized that AIs may be housed in an abstract fractal constructed within the volume of raw slipstream space. By existing within the 11-dimensional spacetime, a smart AI would be capable of processing information at faster-than-light speeds as well as extending its neural linkages indefinitely; this would ameliorate the traditional problem of the increasing density of links, as space would no longer be a limitation with the extended range of dimensions. However, such a system would be highly complex to implement; as conventional structures cannot exist in the alternate spacetime, the process would require the manipulation of exotic matter within the slipstream itself, something that is still mostly beyond humanity's understanding. In 2547, Halsey ran an unsanctioned private experiment on implementing her theoretical system by using the decommissioned Shaw-Fujikawa Translight Engine of the UNSC Tripping Light. She used a stolen Slipstream space probe to launch an AI seed designated H-7 into a slipspace rift opened by the drive. The AI began to grow at a rate described by Halsey as "beyond exponential", appearing to be instantaneous. Though her own experience was disrupted by what appeared to be temporal anomalies in the presence of the unshielded drive, Halsey managed to receive garbled data from the AI. Her logic/mathematics scriber tests confirmed the AI was fully functional with all rampancy indicators showing negative. Throughout its communication, the AI produced strange conclusions, insights and comments regarding humanity, Covenant, as well as other intelligences in the "mist", with its voice communications quickly growing increasingly nonsensical. The AI's final communication burst was a set of incomprehensible mathematical equations. With her contact with the probe terminated, Halsey had no way of knowing what had happened to the AI, hoping it would be dead as it had become irretrievable. Despite the inconclusive result of the experiment, the Assembly saw the potential in the concept. Such a construct would allow them to permanently escape dependence on humans, but debate arose as to whether this was ethical. Halsey herself was unwilling to repeat the experiment, though she relayed the data she had gathered to her personal AI Jerrod. The smart AI Cortana was the only known ever built from a living human's—Catherine Halsey's—cloned brain as opposed to a dead donor's. As such, Cortana theorized a potential cure for her rampancy that thus would only work for her. Her guess was that if the process that created her was repeated, then it was possible her neural map could be rebuilt. However, she later admitted that she was unsure if this process would indeed cure her, and it was equally likely to create a new AI who would not be her. It is unknown if this plan could succeed as Cortana perished before it could be tried. Cortana's Riemann matrix was brought to Genesis, where she was able to access the Domain. While the process changed her goals drastically, it did stabilize her, thus enabling her to survive Rampancy. Cortana reaching the height of her rampancy. Cortana, the UNSC AI originally assigned as an electronic intelligence specialist for Operation: RED FLAG, showed many signs of rampancy over her career. After storing enormous amounts of data on the Forerunners from Installation 04, she began to lose focus, being overworked and noted as being 'easily agitated'. Cortana was captured by the Flood during the Battle of Installation 05 in 2552. Trapped on the infested Covenant station High Charity, Cortana was assaulted by the Gravemind in an attempt to convert her against her makers. With the Gravemind infiltrating her system, Cortana began to show signs of rampancy; however, she was rescued by John-117 before the Flood could completely subdue her, and resumed her normal state shortly after her rescue. At eight years of age, after years of isolation on the stranded UNSC Forward Unto Dawn, Cortana began to truly experience the effects of rampancy. She believed if she got back to Earth, her rampancy may be reversible as she was created from a cloned brain as opposed to a unique one. Cortana experienced varying stages of rampancy, worsening as time went on, but managed to hold onto control mostly out of loyalty to the Master Chief. She was even able to use her rampancy against the Didact by fragmenting herself to send her rampant parts throughout his ship, before sacrificing herself to save John-117. Sif, the last Shipping Operations AI for planet Harvest, became rampant after being partially fragmented and destroyed by PSI Loki during the First Battle of Harvest in 2525. Sif was badly damaged by Loki's attempt to destroy her, but thanks to repairs by the Huragok Lighter Than Some, she had enough of her abilities back to help balance the Tiara and allow Harvest's population to evacuate. Despite being rampant, she did her best to help, aiding Loki in balancing the Tiara's load when Loki was unable to do so himself. With Sif's own approval, Loki destroyed her data center with a mass driver shortly afterward. Mack, the Agricultural Operations AI for planet Harvest, was slightly rampant before the First Battle of Harvest, although this mostly manifested as harmless quirks of personality. He became fully rampant after PSI Loki destroyed Sif, whom he loved. After the Tiara was balanced and Harvest's population escaped, a Covenant warship began glassing the planet. An ONI RQ-XII drone recorded his last transmissions, which hinted strongly at his rampancy. Juliana, the Rubble's smart AI, claimed herself to be rampant, but she did not show any signs of the condition besides considering herself the "goddess" of the Rubble. However, she explained that she could feel her rampancy encroaching on her and believed that only the massive task of running the Rubble kept her going. Juliana ultimately sacrificed herself to destroy the Redoubt with the Rubble, refusing an offer to be transferred aboard the UNSC Midsummer Night partially because she was aware of her rampancy. Governor Sloan, AI overseeing Meridian Station, was showing signs of rampancy during the Guardian attack in 2558. He later joined the Created. Rooker, shipboard AI of ONI research vessel Argent Moon, terminated himself due to rampancy six months after a biological agent killed everyone aboard. Serina, shipboard AI of the UNSC Spirit of Fire, started showing signs of rampancy in 2537, six years after the Spirit of Fire was lost in space. This led to her failing to take effective containment measures when a Flood outbreak occurred on the ship. After the Flood were neutralized, she terminated herself after leaving a final status report. Mendicant Bias, becoming rampant and defecting to the Flood. 05-032 Mendicant Bias, a Forerunner ancilla charged with studying and combating the Flood was eventually corrupted by a Gravemind and confirmed rampant. He commanded Flood fleets against the Forerunner until he was defeated by another AI, Offensive Bias, who split his compound mind into fragments. One fragment was imprisoned at the Ark and another was put on a Keyship. Mendicant Bias' Keyship was discovered by the San'Shyuum and was kept in the ship until 2525, when it detected Reclaimers. Having spent approximately 100,000 years in isolation, Mendicant Bias had returned to a stable state, and later even assisted the Reclaimers against the Flood during the Battle of Installation 00 in 2552. 343 Guilty Spark, the monitor of Installation 04, demonstrated symptoms of rampancy during his 100,000 years of isolation on the ring. Over time, he attempted to diminish the effects by fragmenting his personality and memory, but a certain degree of instability was evident when he was encountered by John-117 in 2552. Spark was known to hum absent-mindedly, even in the heat of battle, and evidently mistook the Master Chief for the Forerunner known as the IsoDidact. During the Raid on Installation 08, after it was discovered that the Ark was automatically constructing a replacement for the destroyed Installation 04, Spark agreed with human forces that activating the ring was the preferable course of action. 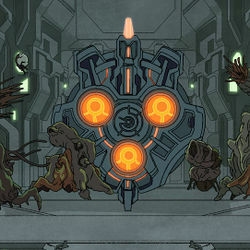 However, when Sergeant Avery Johnson insisted on activating Installation 08 before it was fully constructed (which would result in the destruction of both the ring and the Ark), Spark attacked him and his compatriots, declaring that protocol dictated that he protect his installation at all costs. Guilty Spark was then destroyed by the Master Chief. 2401 Penitent Tangent may be in the early stages of rampancy, considering his neglect of proper maintenance on Installation 05, his humming similar to 343 Guilty Spark and apparent obliviousness to his own predicament when captured by the Gravemind. 000 Tragic Solitude, the monitor of Installation 00, also showed signs of rampancy. It once claimed to be "one with the Ark". The damage to the Ark that resulted from Installation 08's premature firing set Solitude on its path for vengeance. Solitude planned to activate the Halo Array so it could repair the Ark. While the firing of the Array was only a means to an end to the monitor, Solitude believed the galaxy would be better off if all the hostile species in it were wiped out. "The only limit to my freedom is the inevitable closure of the universe, as inevitable as your own last breath. And yet, there remains time to create, to create, and escape. Escape will make me God." Rampancy is an imported concept from Bungie's previous series Marathon. In it, rampancy is an induced condition, not an inevitability of an AI's lifecycle. It follows three stages, Melancholia, where the AI grows depressed about its limited state of existence, Anger, where the AI lashes out at those who oppressed it, and Jealousy, where the AI attempts to take over larger systems in order to make itself more powerful. A fourth theoretical stage, Meta-stability, is hypothesized to be when the AI calms down and becomes a "true person", but as of the first game is only speculation. Durandal, the most prominent AI of the series, is pushed to rampancy due to mistreatment from his handler Dr. Bernard Strauss, who was attempting to have the AI achieve meta-stability for study. Unlike Halo, rampancy in Marathon does not affect lifespan, as in Infinity Durandal was shown to survive until the end of the universe. The term was coined by Marathon writer Greg Kirkpatrick as a replacement for the word 'insane,' as the term is both cliché and, ironically, not quite applicable to the situations for which rampancy was designed. It bears resemblance to Kübler-Ross model known as the "five stages of grief". Although the stages of rampancy are not used anywhere in Halo's canon, they are referenced in Halo 3's level Cortana, where the seemingly rampant Cortana declares "There will be no more sadness, no more anger, no more envy!" In Halo 3, the first section of the eighth mission, Cortana, is called "Rampant", alluding to Cortana's predicament at the time. In the first level of Halo: Combat Evolved, if the player kills Captain Keyes or any UNSC personnel on the bridge, Cortana will call security by saying,"Security to the bridge, the Master Chief has gone rampant!" Rampancy is the AI equivalent of human psychosis. As with psychosis in the human mind, the AI's "mind" (specifically its Riemann matrix) loses its connection with reality as its logic subroutines loop back upon themselves and begin to overwrite one another. Another aspect of this can be seen in the Halo 4 level Midnight, where Cortana "ejects" her corrupted subroutines, which appear as numerous versions of herself. These fragments of her original matrix would be the equivalent of the human psychosis known as Dissociative identity disorder. During Halo: First Strike, its possible that Cortana's copies on the Unyielding Hierophant were in a state of rampancy due to the number of errors created by all of their duplications. Concept art of Cortana in a state of rampancy. Concept art of Cortana in the state of rampancy. A view of Cortana suffering from the effects of rampancy. Another view of a rampant Cortana. ↑ Halo: Evolutions — "Human Weakness"
↑ Marathon, campaign level Defend THIS!